The sticker on my windshield tells me that my car needs an oil change every three months or after so many miles. Also I go in for a spiritual oil change at least every three months, preferably every one or two. People have done that since the dawn of time. In recent years spiritual direction has entered the mainstream. More and more people understand that body, mind, and spirit need regular check-ups and check-ins. And where there is a demand, there will also be a supply. Spiritual direction comes out of the monastic tradition but is now available to everyone and offered by persons from a variety of backgrounds. 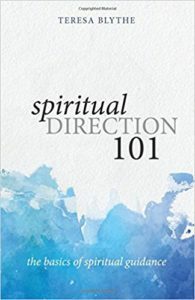 In her book Spiritual Direction 101, Teresa Blythe addresses those who want to hang their shingle and become active practitioners of spiritual direction. Now Blythe continues to remind her readers that everybody can simply call themselves spiritual director. The title and the work and not regulated in any way but she insists on maintaining the ethics of the profession as outlined by Spiritual Directors International. One big take-away for the aspiring or practicing spiritual director is to not do this work alone. Blythe continues to emphasize that spiritual directors receive supervisory spiritual direction themselves. – What is it you care most about in life? – When do you feel most fully alive? When do you feel least alive? Although there is skill and knowledge involved, Blythe keeps reminding her readers that, “this is one of the great tests of spiritual direction: If you can remember that God is the true director.” Whether you work with groups or individuals, whether you work with cisgender or transgender persons, whether you work with people who are similar to you or very different, spiritual direction is about “honoring the third chair” – a reality that transcends the here and now. From this spirit of inclusion Blythe details how to work with the aging, the addicted, clergy, and other groups. Finally Blythe gets into the nitty gritty of setting up shop: location, decoration, pricing, marketing and much more. Spiritual directors see their directees in coffee shops, church offices, professional offices or retreat centers. Their fees range from free to top dollars. Working your call to become a sustainable praxis requires a lot of discernment. It is probably best to check in with your own spiritual director about that when you meet next time. Oh, by the way, you don’t have to do spiritual direction as a stand-alone business. It also works well in other ministry settings. I just scheduled my next spiritual oil change.